This is not a good job. No, it makes my feeble heart to throb. A child (me) must to this dread oracle and temple come. Now why is he as icy as my self shall surely be? Forever caught and on display..
Who shall I my terrible plight, plead? So soon as I am done, look you all, see my bitter end! Stringy, shrubby, itchy, grubby, shrubbery, underbrush, flora, foliage, thicket, herbage, verdure, Vegetation…. when they are untended. You see, I get so summery dreamy, lazy, lumbering, thick… I lose my edge, my wit. My weeds grow, my thoughts flitter like fireflies. I can’t wipe the dew or the sweat from my eyes. my wise sayings, become cliches and wives tales. The advisors and leaders are misdirected and soon people are running hither and thither, starting things that I told them to do… when I wasn’t anything but landscape, lulled by limp leaves, and soggy with silly summer thoughts. So what shall happen to me and why have all my friends been turned to stone!?? but I tell you they are still alright. They were sent like you, to clear the oracle, trim me as it were. with their fear comes a little curse. But fear not.. Take the knife and cut a strand..
With each cut, your fellows from their fear, I will command. O for the love of Begonias and Evergreens, would you please just snip! There you see. Try another. By Buttercup I think you have it. While I must snip and snap all this monsters greeny nooks. Such a wild mop of leafy stew? They want me sloppy so to tell their feeble hearts what’s all unreal. While to the town, they boast and raise a mighty holler. Oh, that feels delightful young sire, the trim that blesses. Once again my oracle may sing. but now all melted and flowing over rocks I skip. For little Rivulet has been saved. Eddy, whirl and spin in my delight, I feel my wetness, growing. In the surge and flow so happy, may I never dry. My spring’s nymph. Rivulet by name. Rivulet… this is.. This… is.. Ah, yes..
Cleared your spring and brought me day. But it’s night, it’s night! That all the noble stars above, to thee be led. Enough, enough, what and who are you? Of her dreams she will swim and tell. A talking, giant shrub, that’s all I need. Oh, Oh my, don’t look up, Micoeus don’t look up! Micoeus, don’t look up and don’t say a word. Stare into the stars in the spring, count them, but do not look up. With you, for your service, I will gladly share. Then with my eels, we wheel and slide and roll. All on a summers night. Cobwebs and spiders weaving, I search for tasty bugs. My snaky sisters nine to summers sinister whispers hug. My poison thus delights and burns each soul I spy. Through poisons illusion let us lead them all astray. And let every good deed freeze. An endless, endless summer without care. To see what selfishly has powers. Gobble all that makes them drool. Earth’s growing force alone we crave. Weave in each our summer spell. Dream of bliss in never land. So from heaven you will droop. Zeus, Zeus knew not the power of nature’s force. First it was Metis that he ate. So with many disguises could he play and charm. Women’s secrets, only, once filled the universe. Zeus ate Metis, my mother and she, gave birth to Athena. She should have given him more than a headache. I hold the earth’s summer secrets. Seeking those who fear autumn’s spirit awakening light. To their souls, I bring my hydra headed blight. Will in them fall foul and rot. I see the passing stars, beneath my bushy hair. My limbs feel heavy from your frosty stare. But of your haunting terror, I will stand unafraid. It is thee, who shall be frozen, it is thee who will be alone. Your leafy garment, mere brittle leaves and death. Rivulet, your clear spring, frozen with my icy breath. Humans wish to sleep, that is why they live on vain regrets. Your dead limbs, will make for me a lovely shrine. One thousand four hundred ten, one thousand four hundred eleven, one thousand four hundred twelve… Holy cow Itonus, you shouldn’t talk back to her. She is mean. Is it true, is it true? Will she return and make firewood out of you? When she returns, you must be prepared. When she passes through my grove again, you must slay her. Ya, right. I must slay her? Right. I must be gettin’ back to town. I am very glad to have met you and I am very happy you released my friends, but this is where my trouble started and this is where it ends. I can’t make you. I thank you for all you’ve done. You and your friends have been, almost, wonderfully brave. Now Javlinikus, Pedijog, Diskoseus, Micoeus come gather round my roots here, by the spring. I wish to bid you fond farewell from this my humble oracle. What large fireflies, buzz and whirr overhead. They seem too large for fireflies, what are they Itonus? They look like little flaming Discus sprites. Every year the great hero Perseus swings his mighty star sword and then begins the haunting of the groves and towns and souls of men. Perseus swings his sword to awaken them. Medusa’s ghostly head awakens from the mist and her ghostly wish is to infect all souls with endless, dreamy Summers bliss or turn them to rigid stone. But wasn’t Medusa already killed by Perseus? Indeed, but from her spilled blood..
Men’s hair, stood on end, like a crown. to give the invisible names. Brought the dead to life or killed. So to heaven we may not lie. 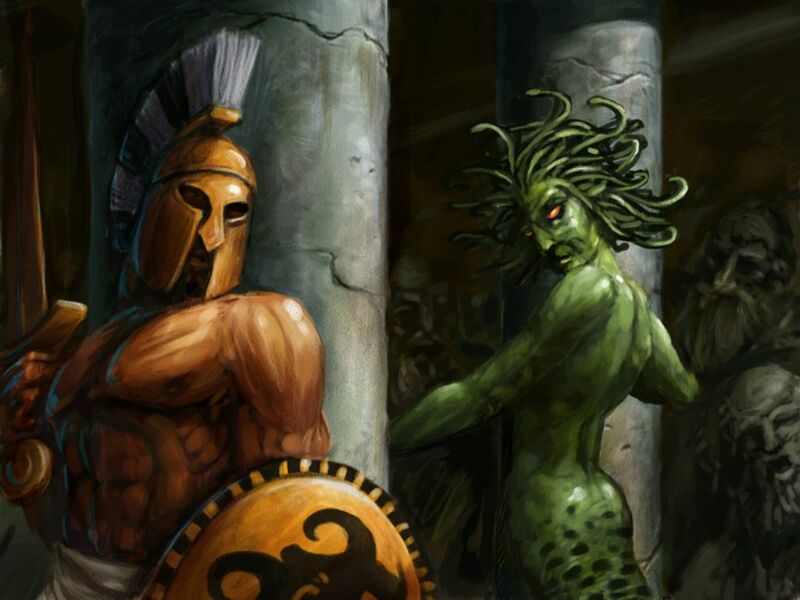 Bring us your hero’s might, that Medusa we may here fight. Do you know the labors and betrayal of Hercules? With his might the monster defeating. Was Medusa more evil than this? Till he killed that immortal hiss. And mighty the golden deer, that Hercules chased for a year. Bad Boar found no place to go. How the barn was loaded with dung. Washed the barn clean of its dung. Were shocked by the sound of a rattle. Till their wings were broken in battle. Who gave her a terrible son. The fiery bull to defeat. Tender human pieces of meat. They hated those critters who shave. To grab the girdle he had to be quick. Kept his cattle tight in a ring. As Hercules had him arrowed. With a dragon all chained in the yard. But the Apples he did not lack. To make ghosts and nightmares be tame. To the light, by Hercules led. Hera made it hard for his hero’s heart to shine. That is right. I see now. Hera tried to show how humans will always be subject to death. How the greatest hero must also suffer terribly. Even if they are blessed under the holy star of Zeus. Even if they are heros born. Born under Perseus. To terrify the hearts of the Trojans. Of Medusa the sister of Gorgons. The celestial constellations in their dancing. The Pleiades, Hyades, Twins and Taurus and Crab. The fierce heat of the Lion’s hot breath. Struggling prey caught by enchantments. At the sight of Pegasus wingspan. Had grown from Medusa’s blood. Achilles, Hercules, Perseus, all had to strike out the fear of the Medusa in their hearts. A polished shield, a mind so clear that only by reflection, can you escape her death that draws so near. To see her own reflection, in little Rivulet’s spring, will freeze little Rivulet. You can keep Medusa from the heart of town by each of you showing courage from the heroes that you’ve known. I’d, I’d, chop off her head. I’d snip each snaky sisters that from her evil they have fed. I’d drag her behind Pegasus, like a ball and thread. But how can we slay a ghost. A thing that slithers in our fears? That whirr and whizz through the starry night? Each year that curving blade of Perseus, sends forth these fiery iron racers. Each year the ghost of Medusa, rises with cool damp mist. She rises from her swampy lair and starts to brush her ghostly hair. Her restless hunt begins, coating tree and bush with frost.. But in humans her icy stare becomes more mean. You must bat one of those streakers that fly through the sky. They are the fiery force of Autumn’s spirit word. Come Perseus send us a good pitch. Oh Medusa, Medusa! They may forget where I’m at. Pedijog, the bat, I feel her near. You look so pretty today who does your fine hair? You haven’t a shot yet. Here! Here! I am a nice fat sleepy, juicy human, you hoo! Medusa! I’ll lure her up to the Spring. When you get a shot at her, I’ll duck. Here get a swing. Medusa, I have heard of your beauty. You said you would offer me a crown. I certainly deserve it. I am handsome and lazy and love to sit on the beach and get tanned. In fact just this morning I built two sand castles dedicated to you. If you come to me, I will take you there. Just turn around and you will see. What I can’t hear you. Where are you beautiful Medusa? Are you there? I can hardly wait much longer. Hit one of those things or I’m goner. We’re trying.. We’re trying! Perseus is putting spin on these things. What name was whispered through the trees? I heard a horrible name sisters… What was it? No, no, not little Rivulet. Rivulet is frozen.. Frozen! Quick before Itonus is also Frozen. Medusa you cruel witch. Poor little Rivulet is dead. I warned you oracle. I would seize your limbs and freeze them to make for myself a shrine. Now your weedy cycle ends. In dreams must you fade and die. History, Comedy, Tragedy, Dance, Music, Astronomy, the sacred flute, Cosmic destiny, Songs from the human heart. Releases your inner powers, Medusa can’t steal your wealth. When the skin of the snake is forsaken your spirit rises to birth. Seek for us in your learning and courage you always will find. But humans awaken compassion as autumn leaves ready to fall. Nine great spirit virtues arise from each human I. 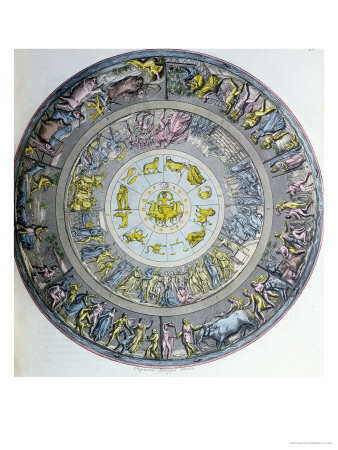 Description of Shield of Achilles from Euripides- Greek Playwright 484 B.C. PURCHASE FOR YOUR NORSE BLOCK THE FOURTH GRADE CLASS PLAY “Gullveig’s Gold” by Bradford Riley CLICK ON PICTURE BELOW.